Plants perennial; densely or loosely cespitose, occasionally stoloniferous. Culms 15-75 cm, erect or decumbent, sometimes branched basally, sometimes branched aerially; nodes 3-6; internodes glabrous or sparsely to densely pubescent with papillose-based hairs. Leaves basal or mainly cauline; sheaths mostly glabrous, finely scabrous, or pubescent, pilose near the ligules; ligules 0.2-0.5 mm, of hairs; blades 1-30 cm long, 1-2.5 mm wide, flat to involute, papillose-based hairs often present on both surfaces, usually present on the bases of the margins. 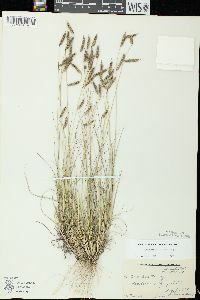 Panicles usually with 0.7-18 cm rachises bearing 1-6 branches, the branches sometimes digitate; branches 10-40 mm, persistent, straight, with 20-50 spikelets, axes extending 5-10 mm beyond base of the terminal spikelets; disarticulation above the glumes. 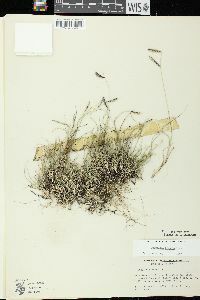 Spikelets pectinate, green to dark purple, with 1 bisexual floret and 1-2 rudimentary florets. 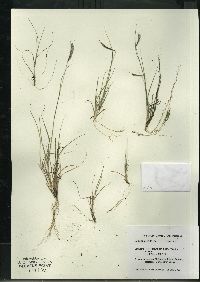 Glumes acuminate or awn-tipped; lower glumes 1.4-3.5 mm; upper glumes 3-6 mm, midveins with papillose-based hairs; lowest lemmas 2-4.5 mm, pubescent, 1-3-awned, central (or only) awns 0.2-2.5 mm, not flanked by membranous lobes, lateral lobes acuminate, unawned or with awns no longer than the central awn; lower paleas ovate, unawned; anthers 2-3.4 mm, cream or yellow; rachilla internodes subtending second florets glabrous or pubescent, sometimes with a distal tuft of hairs; second lemmas 0.5-2 mm, bilobed, 3-awned, awns 2-4(6) mm; third lemmas, if present, minute, membranous scales, glabrous. Caryopses 1.5-2.6 mm. 2n = 20, 40, 50, 60; numerous dysploid numbers also reported. 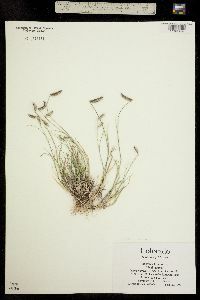 Bouteloua hirsuta is a widespread species, with two subspecies that frequently hybridize in areas of sympatry (Wipff and Jones 1996). 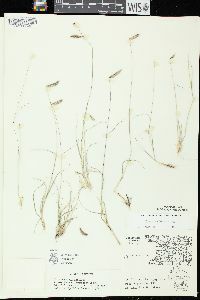 Perennials, Terrestrial, not aquatic, Rhizomes present, Rhizome short and compact, stems close, Stolons or runners present, Stems nodes swollen or brittle, Stems erect or ascending, Stems geniculate, decumbent, or lax, sometimes rooting at nodes, Stems mat or turf forming, Stems caespitose, tufted, or clustered, Stems terete, round in cross section, or polygonal, Stem internodes hollow, Stems with inflorescence less than 1 m tall, Stems, culms, or scapes exceeding basal leaves, Leaves mostly basal, below middle of stem, Leaves conspicuously 2-ranked, distichous, Leaves sheathing at base, Leaf sheath mostly open, or loose, Leaf sheath smooth, glabrous, Leaf sheath hairy at summit, throat, or collar, Leaf sheath and blade differentiated, Leaf blades linear, Leaf blades very narrow or filiform, less th an 2 mm wide, Leaf blades mostly flat, Leaf blade margins folded, involute, or conduplicate, Leaf blades more or less hairy, Ligule present, Ligule a fringe of hairs, Inflorescence terminal, Inflorescence with 2 or more spikes, fascicles, glomerules, heads, or clusters per culm, Inflorescence a panicle with narrowly racemose or spicate branches, Inflorescence with 2-10 branches, Inflorescence branches 1-sided, Inflorescence branches terminating in bristle or point, Flowers bisexual, Spikelets sessile or subsessile, Spikelets laterally compressed, Spikelet less than 3 mm wide, Spikelets with 1 fertile floret, Spikelets solitary at rachis nodes, Spikelets all alike and fertille, Spikelets bisexual, Spikelets disarticulating above the glumes, glumes persistent, Spikelets secund, in rows on one side of rachis, Rachilla or pedicel glabrous, Glumes present, empty bracts, Glumes 2 clearly present, Glumes distinctly unequal, Glumes equal to or longer than adjacent lemma, Glume equal to or longer than spikelet, Glumes 1 nerved, Lemma coriaceous, firmer or thicker in texture than the glumes, Lemma 3 nerved, Lemma glabrous, Lemma body or surface hairy, Lemma apex dentate, 3-5 fid, Lemma mucronate, very shortly beaked or awned, less than 1-2 mm, Lemma with 1 awn, Lemma with 3 awns, Lemma awn less than 1 cm long, Lemma margins thin, lying flat, Lemma straight, Palea present, well developed, Palea membranous, hyaline, Palea shorter than lemma, Palea 2 nerved or 2 keeled, Stamens 3, Styles 2-fid, deeply 2-branched, Stigmas 2, Fruit - caryopsis, Caryopsis ellipsoid, longitudinally grooved, hilum long-linear. Perennial densely to loosely tufted herb, sometimes with runners 15 cm - 0.97 m tall Leaves: mostly along culm but also basal. The sheath surface is mostly hairless to finely rough or hairy, and is softly hairy near the 0.2 - 0.5 mm long ligule, which is composed of hairs. Blade 1 - 30 cm long, 1 - 2.5 mm wide, flat or with margins rolling toward the upper surface of the midvein (involute), usually with warty-based hairs. Inflorescence: branched (panicle), with one to six branches borne on a stalk 0.7 - 18 cm long or sometimes arising from a common point (digitate). 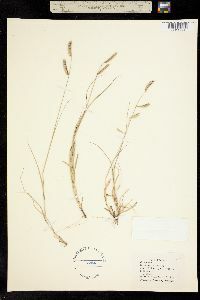 The straight branches are 1 - 4 cm long and extend 5 - 10 mm past the base of the uppermost spikelet. Fruit: a caryopsis, 1.5 - 2.6 mm long. Culm: 15 cm - 0.75 m long, erect or decumbent, sometimes branching near base or above, with three to six nodes and internodes that are hairless or have warty-based hairs. 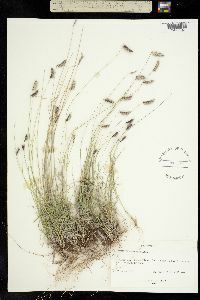 Spikelets: 20 to 50 per branch, arranged on one side of the axis, green to dark purple. 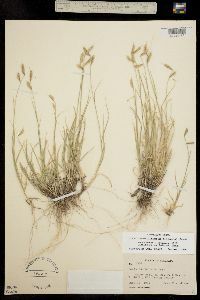 Glumes: unequal, pointed or awn-tipped, single-veined, the midvein having warty-based hairs, with the lower glume 1.4 - 3.5 mm long and the upper glume 3 - 6 mm long. 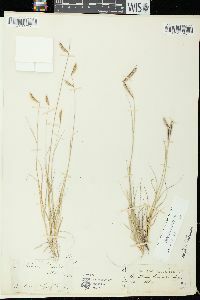 Florets: two or three per spikelet, with one bisexual and one or two poorly developed and sterile. 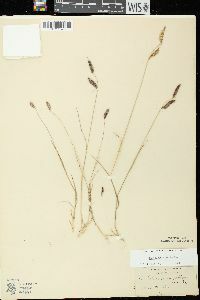 Bisexual florets have cream-colored or yellow, 2 - 3.4 mm long anthers. Lemma: of bisexual floret 2 - 4.5 mm long and hairy, with the middle lobe having a 0.2 - 2.5 mm awn and the lateral lobes either pointed or with awns shorter than the middle awn. 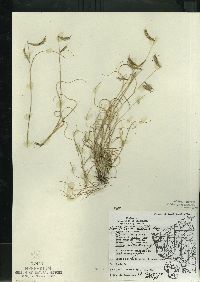 The lemma of each sterlie floret (if present) is 0.5 - 2 mm long, two-lobed and three-awned or reduced to a tiny membranous scale. Palea: unawned and egg-shaped on bisexual floret, absent on sterile floret. 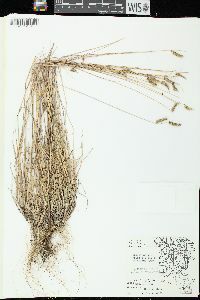 Similar species: Bouteloua curtipendula differs by having many more branches (twelve to 80) on a longer stalk (13 - 30 cm) and only one to fifteen spikelets per branch. 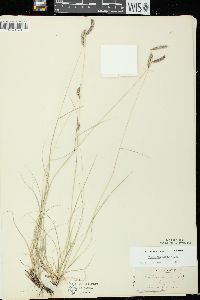 Bouteloua gracilis has more spikelets per branch (40 to 130) and the branch axis terminates with a spikelet. 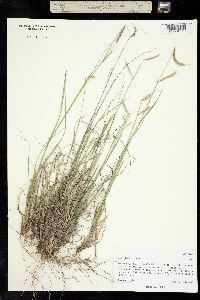 Habitat and ecology: Very rare in sandy prairies. Etymology: Bouteloua is named after Spanish botanists and brothers, Claudio (1774-1842) and Esteban (1776-1813) Boutelou y Soldevilla. Hirsuta means "stiff-haired." Densely tufted perennial 1.5-6 dm; lvs mostly crowded toward the base; sheaths pilose at the throat; blades flat, 1-3 mm wide; spikes 1-3, usually 2, straight or recurved, 2-4 cm; rachis projecting 2-5 mm beyond the uppermost spikelet as a straight stiff point; spikelets numerous, closely imbricate, divergent; first glume subulate; second glume lanceolate, 3-4 mm, densely papillose- hirsute on the prominent midvein; fertile lemma about equaling the second glume, sparsely villous throughout, its awn short and flattened; vestige long-stipitate, glabrous at base, obconic, often reaching the summit of the second glume, its 3 awns equal, exceeding the tips of the fertile lemma and second glume; 2n=12-50. 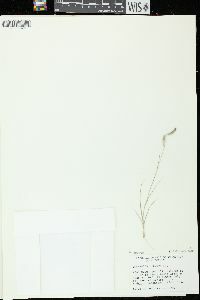 Dry prairies and sand-hills; Wis. and Ill. to N.D., s. and w. to Tex., Calif., and Mex. ; Fla.